Wings! Nothing draws the football-watching, pizza-loving, bar-going, after-hours-craving folks in like a neon sign pro-porting some sort of inexpensive wing gimmick to pull in potential customers. There are all sorts of wings, with each type carving its own niche market (and palate). For some reason I have considered wings as one of those things that I like to eat, but really don’t ever want to make. I’m not sure why, because as this Chicken Monday will prove, wings are incredibly easy to make. Line a pan with foil and spray with non-stick cooking spray. 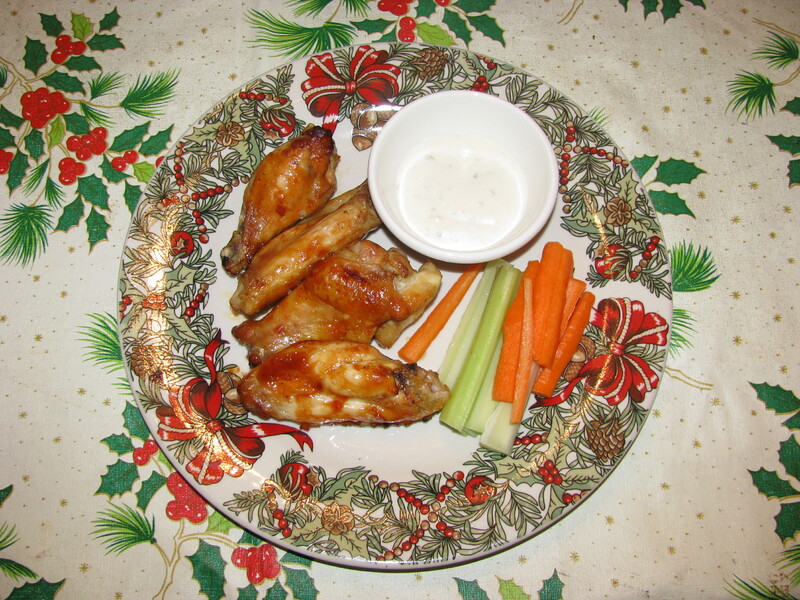 Baste wings with your favorite BBQ or Hot sauce. Bake for 30 minutes, then flip the wings, re-baste and bake for 15 more minutes. That’s all folks! I couldn’t believe how easy this was! I searched all day for wing recipes, some of which included marinating the wings or broiling them, but this was by far the easiest preparation. The wings came out incredibly juicy and were very tasty. I served them with the standard carrot/celery sticks and blue cheese for dipping. I also quickly made a box of Annie’s Homemade Curly Fettuccine with Broccoli, a household favorite. All being said and done (including the dishes), I will definitely make this wing recipe again. However, given the option, I will have my brother continue to provide the wings for family affairs as his are much tastier. How does he do it? I would invite him as a guest blogger, but I’m not sure he’s ready to give up his recipe.